Jon Criss' Blog: Firearms Freedom Advances In Virginia! HB 69 recently passed the House of Delegates overwhelmingly (70-29) and is now before the Senate's Courts of Justice Committee. Introduced by Del. Charles Carrico (R-5) and known as the Virginia Firearms Freedom Act, HB 69 is modeled after similar legislation which has been successful in other states, including Montana -- the first state to pass such a law. This is important because the Commerce Clause is the "hook" that Congress has used to justify almost every single federal gun control law. But with the passage of HB 69, the Commonwealth will take a stand that guns stamped with the words "Made in Virginia" are no business of the federal government. Now that we've breezed through the House, we can expect anti-gun forces to try and kill this excellent measure in the Senate. Therefore, it is imperative that we make it impossible for senators to do the bidding of the enemies of freedom. Sounds like we moved to a place that has some common sense. 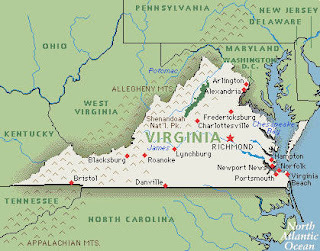 Do you know why it is called the "Commonwealth" of Virginia instead of "State" of Virginia? I asked a local yocal and she said she didn't pay attention to that part in school. So I still don't know. Why is Virginia called a commonwealth? This designation, which has no constitutional impact, emphasizes that they have a "government based on the common consent of the people" as opposed to one legitimized through their earlier Royal Colony status that was derived from the King of Great Britain. The word commonwealth is of English derivation and refers to the common "wealth" or welfare of the public. In common parlance, people do not make the distinction between state or commonwealth.